Best Ever Easy Southern Caviar Dip aka Texas Caviar, South Georgia Caviar, Lower Alabama Caviar, Cowboy Caviar, Hillbilly Caviar, Redneck Caviar, South Carolina Caviar, Southwest Black Bean Salad, Corn and Black Bean Salad, Black Bean and Corn Salsa, and Black-Eyed Pea Salad, the list goes on and on. 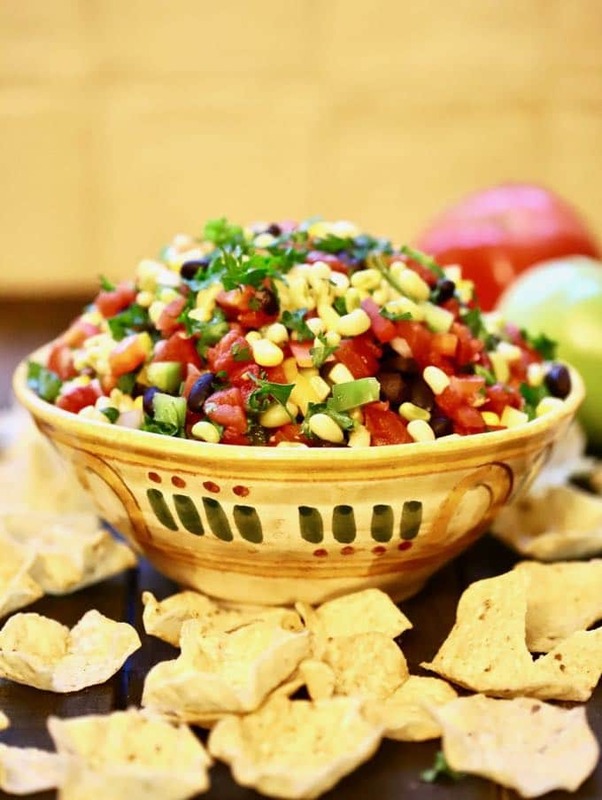 No matter what you call it, or how you serve it, this easy to make, bursting with flavor, healthy dip/salad/salsa is perfect for tailgating, a game-day party, picnics, holiday parties or anytime you want to impress your family or friends! If you are wondering how the term caviar came to be in this recipe’s name, it has little to do with its fishy namesake, sturgeon fish roe. It is just a funny comparison of the lowly black-eyed pea to the much more expensive delicacy, caviar which was coined by Helen Corbet who first served this dish in Texas many years ago. 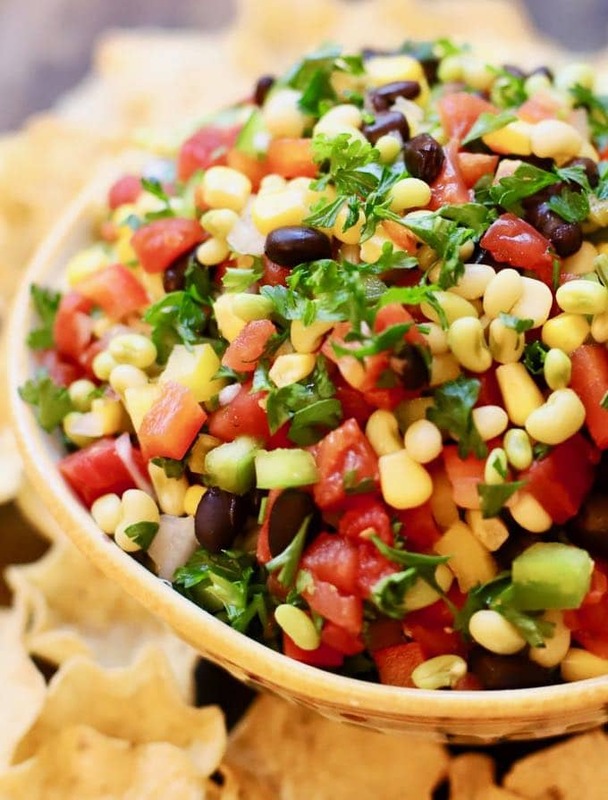 Talk about healthy; have you ever seen an appetizer with so many delicious veggies in one bowl? You know me and my love of all things cheese, but honestly, I don’t miss the cheese one bit in this colorful, flavorful, versatile, and nutritious dish! In fact, my husband has been out of town this week for work, and I have eaten this dip/salad/salsa for lunch and dinner for three days in a row! I know, that’s crazy, right? But it really is that good! 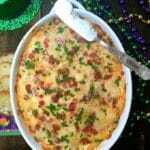 Now you might be wondering why I’m calling this dish Best Ever Easy Southern Caviar Dip? Well, pretty much all of the variations of this recipe I’ve seen list black-eyed peas as the main ingredient. I mean how much more southern can you get? But I thought I would up the ante just a little, and I substituted fresh white acre peas for the black-eyed peas. 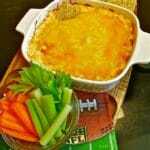 Oh, my goodness, this dip is divine with black-eyed peas, but the fresh white acre peas send it to the moon and back! You could also substitute lady peas, crowder peas or another kind of Southern pea or even leftover succotash if you have it. Special thanks to my friend Carolyn Haley for lending me this beautiful bowl for my photos! 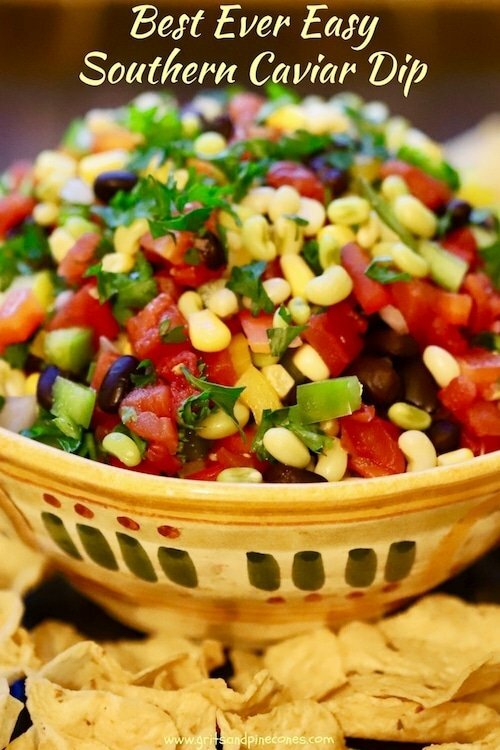 The Southern vibe in this dip/salad/salsa continues with the addition of olive oil and sweet Vidalia onions from Georgia! You have probably heard of Vidalia onions, but I’ll bet you didn’t know they grew olives in Lakeland, Georgia, much less produced a high quality extra virgin olive oil. I had heard about the olives and olive oil, and when I spotted a bottle at a farmers’ market in Thomasville, Georgia last week, I grabbed it. It is delicious, and I like the idea of knowing where it came from. 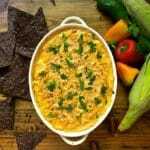 If you like dips like this, you might also like these easy and delicious dips: Easy Cheesy Hot Corn Dip, Buffalo Chicken Dip, Easy Chicken Ranch Dip, and Easy Mardi Gras Hot Muffuletta Dip. 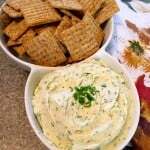 The ingredient list for Best Ever Easy Southern Caviar Dip is lengthy but don’t let that deter you. You just throw everything in a bowl! 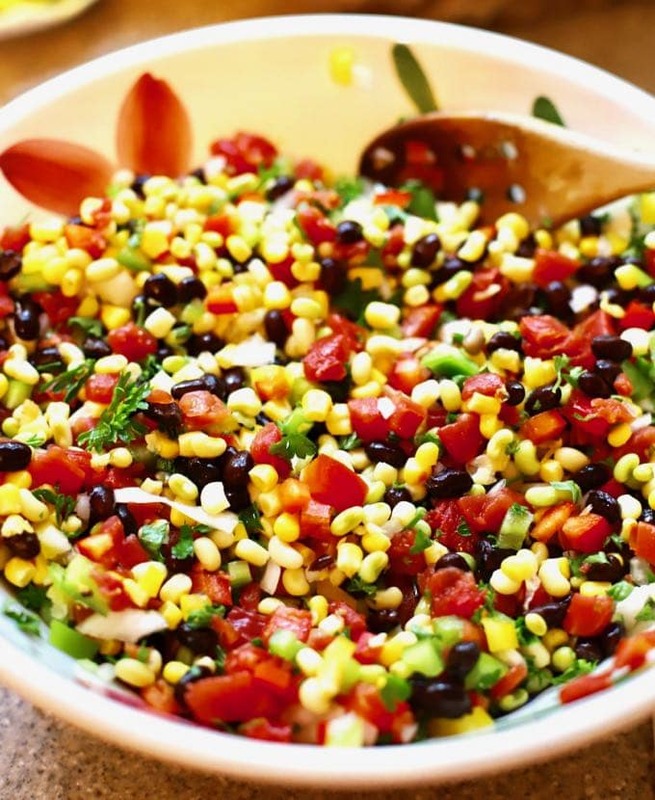 For this recipe you will need fresh cooked white acre peas or a can of black-eyed peas, a can of black beans, fresh corn on the cob or a can of corn, a Vidalia onion or another kind of sweet onion, red, yellow and green bell peppers, fresh tomatoes or canned diced tomatoes, jalapeno peppers, an avocado, and cilantro, or parsley if you don’t care for cilantro. For the dressing, you will need a couple of fresh limes, red wine vinegar, garlic, good extra virgin olive oil, and kosher salt and pepper. 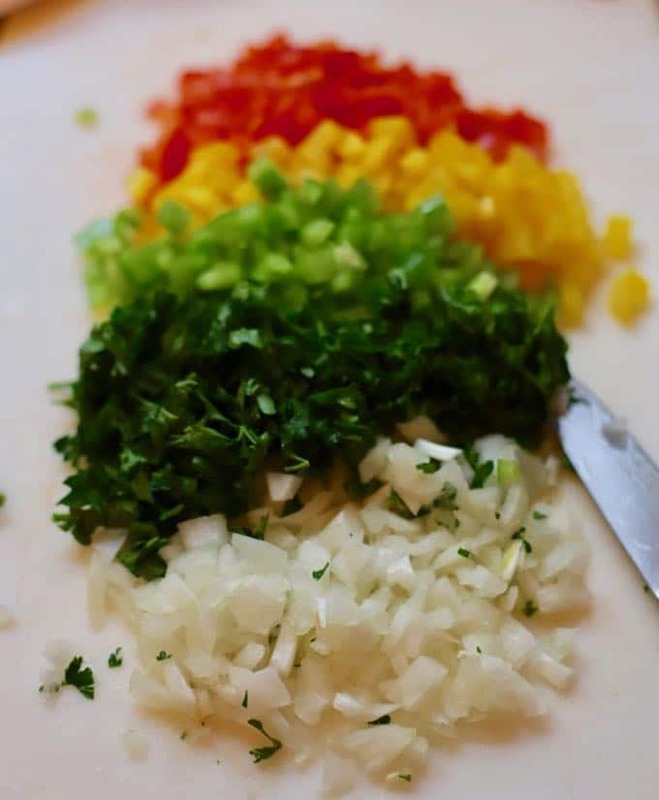 To make this delicious dip/salad/salsa chop the bell peppers, jalapeno, onions, cilantro, and parsley. 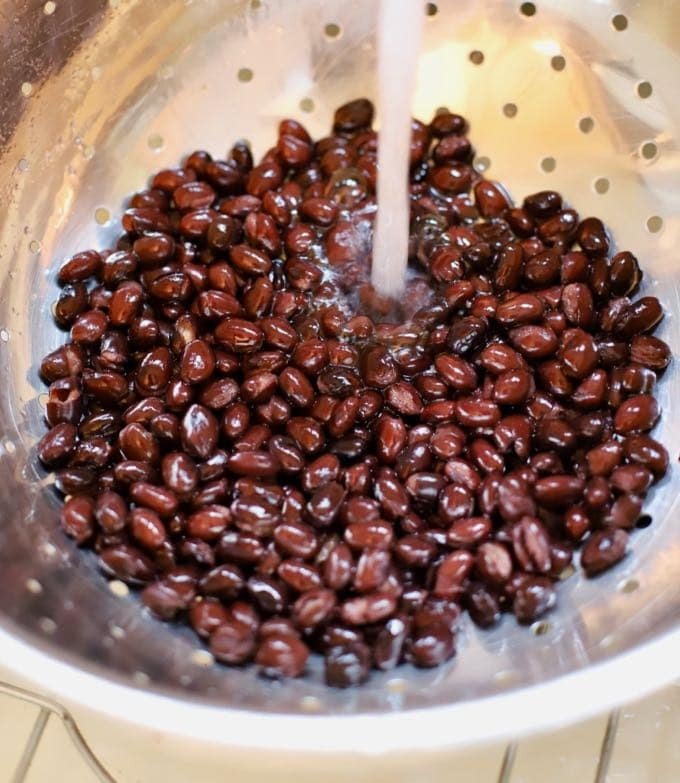 Rinse and drain the black beans and any other canned ingredients. Add all dip ingredients except the avocado to a large bowl and mix to combine. Combine the dressing ingredients in a mason jar and shake well. Add to the dip and combine. This dip can be eaten immediately, but is even better to let it sit for 2-24 hours to allow the flavors to come together! Just before serving, add the avocado, taste and add additional salt and pepper if needed, and combine. 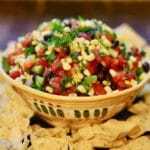 Best Ever Easy Southern Caviar Dip can also be served as a salad, side dish or salsa. 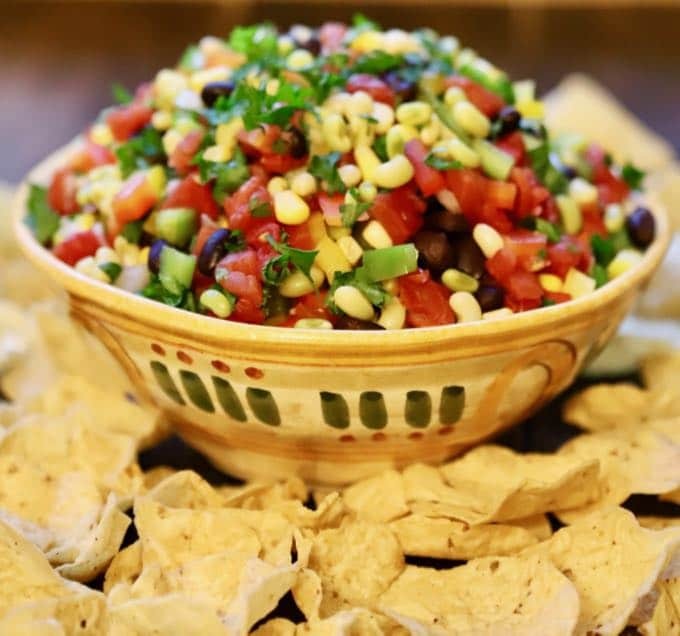 It's bursting with flavor and perfect for tailgating or a game-day party. Add all dip ingredients except the avocado to a large colander to drain. When the mixture has finished draining, add all ingredients to a large bowl and mix to combine. *Just before serving, add the avocado, toss to combine, taste and add additional salt and pepper if needed. Thank you so much for your kind words! I found the Georgia Olive Oil at the State Farmers Market at 502 Smith Ave. Thomasville, GA I think it might be called Lewis Produce. It’s next door to the Market Diner and they have a great variety of pretty much any fresh vegetables you might want including a good selection of all types of beans and peas, both shelled and unshelled. WEH and I are going up to Thomasville on Tuesday for dinner, will go up a little early to dink around a bit. Where did you get the olive oil? Farmer’s Market, next to that restaurant? Forgot to mention, the cavier dip looks amazing. So enjoy your articles AND recipes in the Democrat! Love cooking and of course eating the delicious foods. Thanks so much for all your efforts! Thank you so much for your sweet note! It made my day! I’m so glad you enjoy the articles and recipes! A favorite for us. Thank you so much for this wonderful recipe. Have made it exactly as you have listed and altered the ingredients for the different crowds being served. Everyone loves it! I print the recipe ahead of time because I know they’ll be asking! Thanks so much Pamela! I’m so glad you and your family and friends like it. It’s a favorite of mine too and I’m taking a big bowl of it to a New Year’s Eve party! A classic of biblical proportions! This hits it out of the park on the first taste! An exciting texture and composition that works well atop a cracker or cradled in a tortilla chip…or just eat it with a spoon! The flavors are fresh and full; followed by a simmering med-high heat that waits its turn, politely letting all those wonderful flavors dance on your tongue! I’m not a big guacamole fan, but I’m amazed at how well this works together – this combination is perfect! I give it an “A+”. So stay away so I get to eat it all! Hi Jason, I’m so glad you and your co-workers enjoyed it! Can I just say WOW! I need to get the person who gave you this review to write my blog posts! Very descriptive! Thanks so much for the kind comments! Ha! Yes, I will pass your request onto Roger, he is quite busy with 3 teenage boys!